I went to visit a friend whose property is bordered by an electric deer fence, which gives deer a gentle shock to keep them out of the property. I went for a walk alone on the extreme edge of the property, and there relaxing on the inside of the fence was a beautiful female deer. She saw me, hesitated, got up and ran of, straight through the electric fence which obviously did not phase her at all. As I waslked a little closer, there in the grass next to where the female deer was, a new born fawn was curled up, not moving. Many years ago I volunteered at a wildlife rehabilitation center and I knew that females would run off in an effort to lead predators away from the babies. The fawns are born without scent, and would stay quiet where they are until their mother returns for them. I saw that there was a gate in the fence and decided that I would open the gate and put the fawn outside the electric fence so that the mother could come and get it when I walked off. I opened the gate and returned to the fawn. I had a pair of disposable gloves on me (old rehab habit) and I looked at the fawn which was not moving at all, and I began to wonder if it was ill. There were flies on its face and around its eyes. 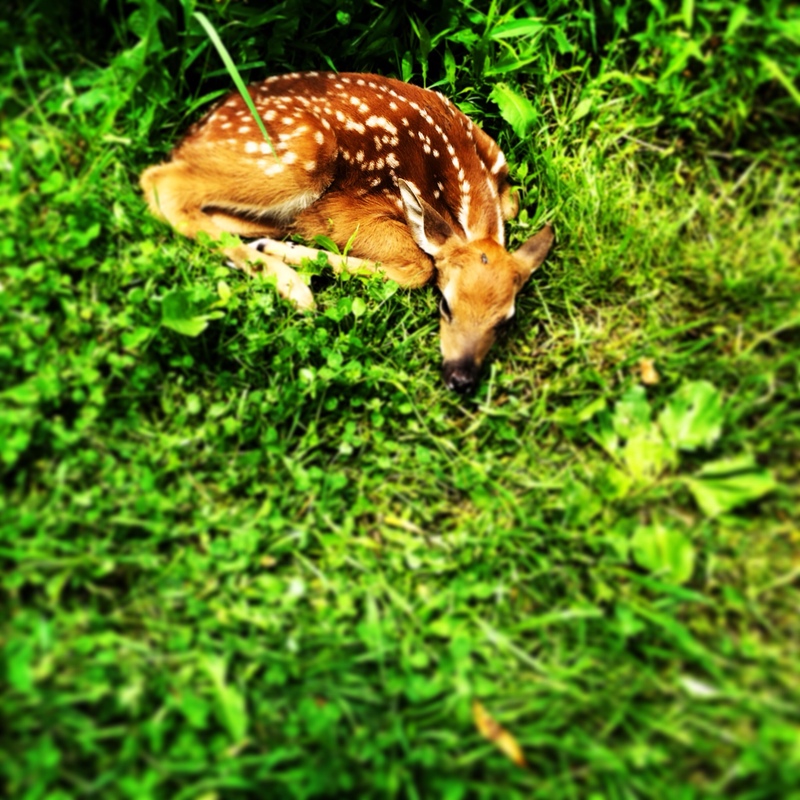 I bent down and brushed the flies away from the eyes and gently patted the fawn, which did not move but only blinked. I was really worried now that the poor thing was really ill, so I gently put my hands around its body and began to lift when it let out a blood curdling scream that scared the hell out of me, got up and bounded off into the tall grass. I stood there watching the fawn run and hide in the grass as my heart pounded in my chest like a hammer and thought to myself “Idiot, you know better!” I knew the mother was going to return, so what the heck was I interfering for. I was doing exactly what pisses off rehabilitators. Interfering. So many fawns are brought into rehab centers because people find them “abandoned”, when the mother is probably just off behind a brush, watching everything that is going on. What lesson did I learn from this little fawn? Unless someone asks for help, mind my own freaking business. This made me laugh! I was all caught up in the poor sick fawn and worried mother then it just runs off. HA!